Fascinating professor, theoretician and atomic scientist J. Robert Oppenheimer, and the World War II era, are being brought back to life by the Bainbridge Island Historical Museum. In this 15-minute podcast conversation with the Museum’s board member, Dennis Tierney, we learn about the upcoming public event called “An Evening with J. Robert Oppenheimer”. 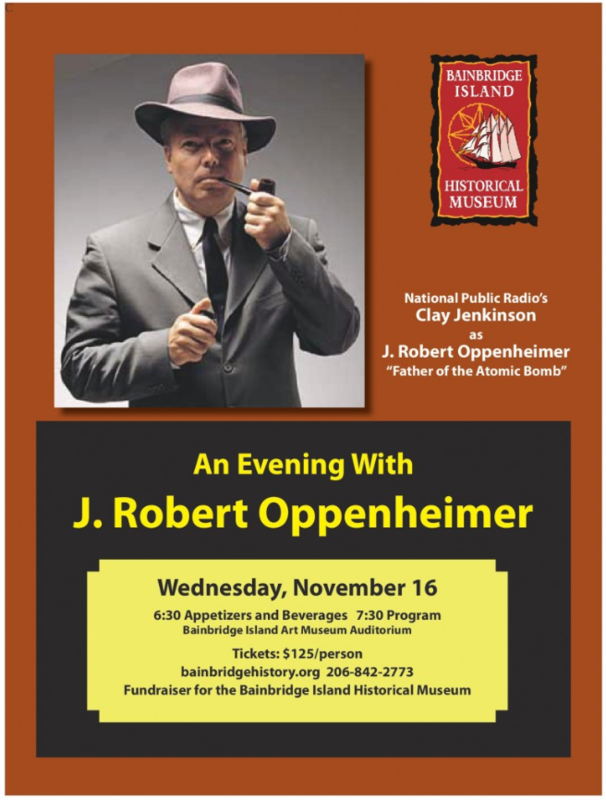 That in-character interpretation of Oppenheimer — the “Father of the Atomic Bomb” — will be in the auditiorium of the Bainbridge Island Museum of Art on the evening of Wednesday Nov 16th, following appetizers and a reception. 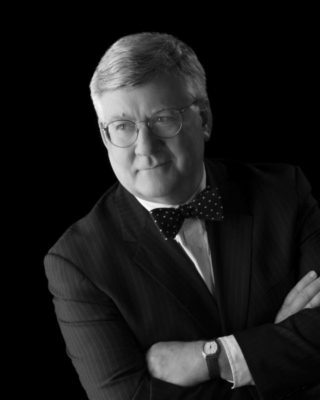 On-stage that night as Oppenheimer will be Clay Jenkinson, a nationally renowned humanities scholar, author and social commentator. Clay has appeared here before sold out crowds in previous Historical Museum fundraisers in roles such as Thomas Jefferson and Teddy Roosevelt. Jenkinson is celebrated as an entertaining presenter, and as a researcher and commentator for films by Ken Burns and in an NPR radio series. Dennis Tierney, a retired local church rector and now a member of the Board of the Historical Museum, is our BCB podcast guest. In this podcast, Dennis Tierney explains that Oppenheimer was not only a remarkably well-educated theoretician and scientist, but he also held sway with his scientific and engineering peers by virtue of his commitment to academic learning, even in diverse areas of languages and religious thought. And yet, after years in the 1940s pulling together the efforts of top scientists and engineers of his day in the Manhattan Project, he was later attacked during the McCarthy era for his prior beliefs and activities and deprived of his security credentials. In this BCB podcast conversation, Dennis also explains that this event sets the stage for the opening, on the December 7th anniversary of Pearl Harbor, of a new historical exhibit about Bainbridge Island in World War II. There, the Historical Museum will revisit not just the dreadful military internment of Japanese Americans, but also the code-breaking radio activities at Battle Point and Fort Ward, and the building of mine-sweepers for the Navy in the former boat works of Eagle Harbor. In support of this November 16th fundraiser, Dennis reflects on the valuable role played by the Historical Museum in helping us connect to our local history, and in supporting a stronger sense of community through a deeper form of citizenship. Tickets for the event are available through the Museum’s website. The ticket price includes the 6:30pm Art Museum reception, appetizers and beverages, the 7:30pm performance, and some financial assistance to the nonprofit Historical Museum.